Professional boxing is coming back in Norway after the recent change of government. Proboxing has been prohibited in Norway since January 1 1981. The exact details are to be worked out but officials in the Norwegian Boxing Federation tells media that the first profight make take place as early as in April 2014. However, amateur organization AIBA where the Norwegian Federation is a member might have a say on who they want to fight professionally. 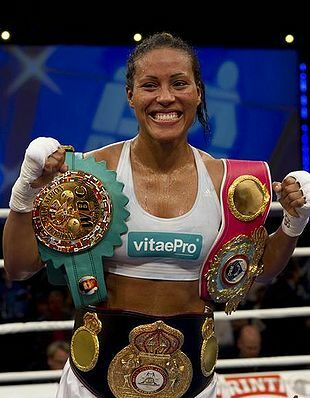 Norway have one big star and that is WBA, WBC and WBO female welter queen Cecilia Braekhus (pictured), who is promoted by Team Sauerland. Polish Babilon Promotions moves underground with their Wojak Boxing Night in Wieliczka October 19. The show is staged in a mine 125 meters below ground and is headlined by heavyweight Krzystof Zimnoch, 16-0-1, taking on Art Binkowski, 16-3-3, in a scheduled eight-rounder. Cruiser Krzystof Glowacki, 19-0, face faded veteran Richard Hall, 30-13. Hall is well remembered in Poland though for his two wars with then WBO lightheavy king Dariusz Michalczewski. Richard got stopped both times but was very close to winning as as he pounded the champ from pillar to post early in their fights only to fade. French lightheavy champ Patrick Bois, 10-1-1, defends the title against vastly more experienced Nadjib Mohammedi, 32-3, tomorrow in Vrigne-aux-Bois. Mohammedi have relinquished the WBFed title to concentrate on more established titles. Nadjib is currently # 4 with the EBU, WBA # 7, IBF # 8, WBO # 14 and WBC # 17. Mohammedi holds the very secret WBA Continental title as well and will defend it if all goes to plan November 9. However, the fight against Bois won´t be easy. WBFed heavy champ Carlos Takam, 28-1, defends the title against Argentinian Raphael Zumbrano, 33-6-1-1, October 17 in Sarcelles (France). It´s first defence for Takam, who won the title by stopping US veteran Michael Grant. Opponent for former IBF welter champ Jan Zaveck, 32-3, October 19 in Leipzig (Germany) will be experienced Frenchman Sebastien Allais, 15-7-4. Zaveck was last seen in March losing to Keith Thurman. Headlining the Leipzig bill is WBO supermiddle ruler Robert Stieglitz taking on Nigerian Isaac Ekpo. SES´ "Schwere Jungs" show in Frankfurt an der Oder October 25 now also features heavyweight Steffen Kretschmann, 16-2, fighting Robert Teuber, 8-0, for the vacant Int´l German title - the BDB version that is. Kretschmann was formely with Arena and showed some promise but saw his career collapse at the hands of Russian Denis Bakhtov and has yet to make it back. The show is headlined by heavyweight Francesco Pianeta vs Brian Minto and lightheavy Robin Krasnqi vs Oleksandr Cherviak. Also on the bill is cruiser Dennis Ronert, 18-0, taking on Kai Kurzawa, 30-4, in a defence of the German title. Kurzawa began yet another comeback this summer after a stint as trainer with the SES stable. Before that he was with EC and before that with Elite and before that with Sauerland. Supermiddles Benjamin Simon, 24-1, and Dutchman Gevorg Khatchikian, 19-0, clash for the vacant IBO I/C title October 26 at the Hansehalle in Luebeck (Germany). In the co-feature Roman Golovaschenko,12-1-1, take on Serdar Sahin, 21-1, for the vacant IBO Int´l cruiser title.